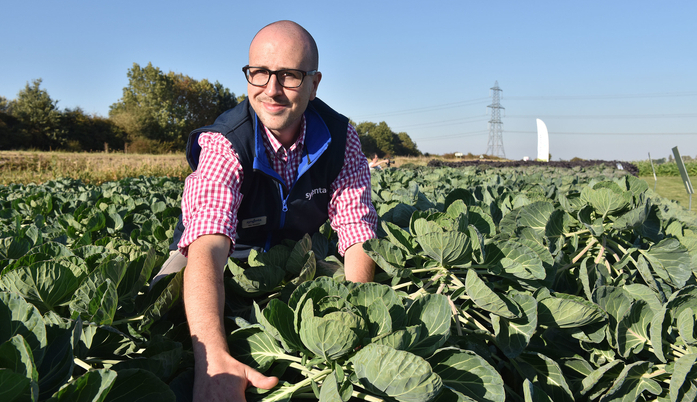 Approval for the new Syngenta insecticide, Minecto One, now gives vegetable growers an essential alternative option for control of a range of insect pests in key crops, ready for next season. The exciting development of Minecto One delivers control of chewing pests with added incidental control of sucking pests. It is approved for use in the main brassicas: broccoli; Brussels sprout; cabbage and cauliflower, along with swedes and turnips. For root crops it is available immediately for both carrots and parsnips, along with a number of niche root crops. Importantly, the registration for Minecto One (cyantraniliprole) also covers outdoor lettuce, along with edible podded peas and vining peas. In brassicas and lettuce the primary target will be caterpillars, including Silver-Y and Plutella on the label. However, the multi-pest activity has been shown to give control of sucking pests, including Whitefly, thrips and leaf miners. There is also useful control of later generations of Cabbage Root Fly. In carrots, parsnips and other approved root crops, use is targeted at control of adult Carrot Fly activity in the crop, to restrict egg laying and subsequent larvae damage to roots. In trials control of both the larvae and adults has been observed. Syngenta Insecticides technical manager, Dr Max Newbert, highlighted that good control of 1stand 2ndgeneration Carrot Fly with Minecto One, could alleviate the need for pyrethroid sprays until later in the season, to target 3rdgeneration Fly. This would reduce insecticide resistance pressure in Carrot Fly, as well as aphid populations. Growers of edible podded and vining peas would use applications for Pea Moth control, timed according to pheromone trap monitoring. The Minecto One application rate, of 185 g/ha, applies for all crops, with growers urged to always use the full rate as a key anti-resistance strategy. “For growers looking to supply the highest quality produce possible, Minecto One has an extremely useful three-day harvest interval in brassica crops and peas. For root crops and lettuce, the harvest interval is seven days,” reported Max. “Salad crops have been hit especially hard by caterpillar damage throughout the growing season this year, whilst Whitefly has been particularly problematic in all brassica crops going into autumn. Dr Newbert advocated sprays should be applied in sufficient water volume to achieve good penetration of the crop canopy, to target pests and gain maximum effect from the systemic movement within the plant. Rapid rainfastness makes it easy to use in the field, and to fit with irrigation scheduling during hot, dry weather conducive to insect pests.